Ethel George is the Women’s Desk Officer for our partner in Vanuatu. She recently visited our office in Melbourne, where we were able to get a glimpse into her life and motivations. You would think that being a mother of four children is a big enough job on its own. But for Ethel George, helping disadvantaged women is an additional labour of love. Ethel is from the island of Ambae in Vanuatu and is the Women’s Desk Officer with the Anglican Church of Melanesia (ACOM) in Vanuatu, our partner in the Pacific Island nation. Anglican Overseas Aid has been working with Ethel and ACOM since 2011, and is currently supporting their ‘Livelihoods and Women’s Empowerment’ project. Vanuatu culture is very patriarchal, which means a focus on women’s self-reliance is important. 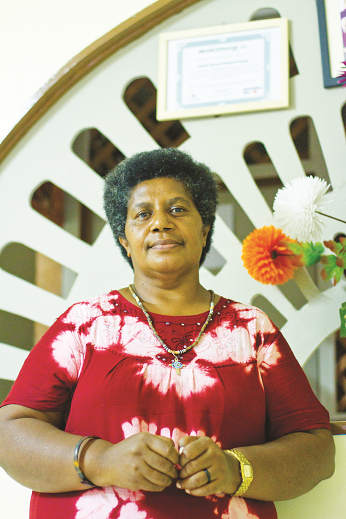 Ethel works with the Mothers’ Union, the only established women’s organisation in the Anglican Church in Vanuatu. She coordinates programs to help women become more self-reliant through income generation, financial literacy, and savings groups. This, alongside Ethel’s community education work, contributes to the reduction of family violence in communities. Ethel believes that one day, gender equality in her home country will become normal and that future generations will see the benefits of it. Those women and families are certainly benefiting from the work of this inspirational leader.